Article 3: The second France 2 Francs Merson The second France 2 Francs Merson was issued in 1907. There is a first 2 Francs Merson, and this web site includes a page dedicated to the Merson issue. Article 16: The France Merson High Values (5, 10, and 20 Francs) I show here pages for each stamp showing color variations (5 Francs, 10 Francs, 20 Francs) and pages with dated specimens showing possible usage ranges as well as some representative specimens (5 Francs, 10 Francs, 20 Francs). Article 30: France Merson First 2 Francs Value The first France 2 Francs Merson is the scarcest value of the series. I show some color variations and a few dated specimens. Article 95: Merson 3 Francs (two issues) The first Merson 3 Franc was issued in 1924. The second Merson 3 Franc was issued in 1927. This latter stamp was the last Merson to be issued. Besides this page showing color variations, I also show a page with selected postmarks for both issues. Article 114: Merson 50 Centimes This is the most common Merson type. 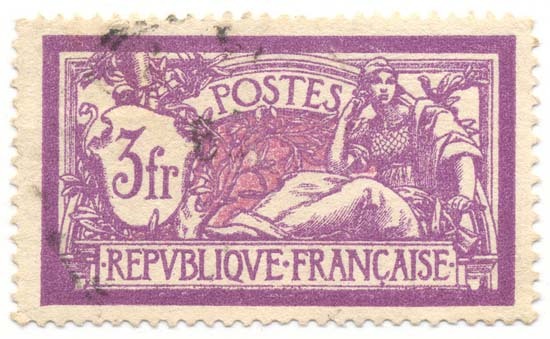 It received heavy postal usage between 1900 until right before the inflationary period in late 1923. There are at least a hlaf dozen distinct printings. Quick links: color varieties, dated specimens, two covers, and perfins.